The area around Edenderry is littered with castles, most of which were built in the Anglo- Norman period, such as Carrick, Kinnefad, Ballyleakin and Brackagh amongst others. Overlooking the town of Edenderry, Blundell Castle is located on a hill from which the town gets its name; Eadon Doire, meaning brow or hill-top of the oak trees. 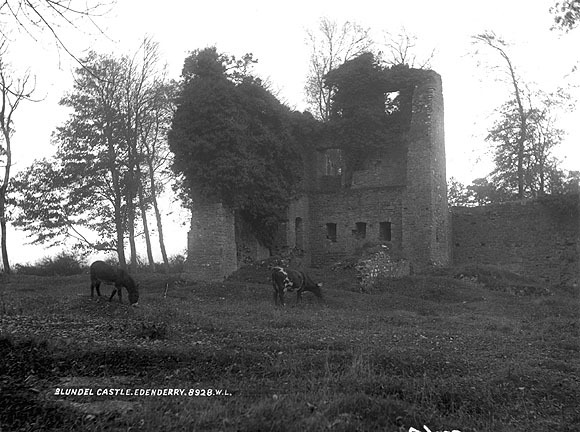 Today, the oak trees are long since gone, but the ruins of the castle remain, a testament to the days of De Bermingham and O’Connor feuding, and later Cooley (or Cowley) power, the family who were granted the lands of Edenderry after the Laois/Offaly Plantation in 1556. In their book, Edenderry through the ages, Evans and Whelan make no mention of a date of the building of Blundell Castle. The earliest mention they make of the castle is when referring to the 1550 survey taken prior to the plantation, which mentions “a path to the castell of Eadandyrre”. The remains of the present castle, or tower house, can be traced to the arrival of the Colleys in 1562. However, there was clearly a castle and perhaps a tower house, which pre-dates that of the Colleys. This castle was of Norman origin, built by the De Bermingham’s, as part of their defence of the locality which incorporated the castles at Carbury and Carrick. The three castles located on three hills over looking the edge of the Bog of Allen, can be seen from each other, which obviously was an added sense of security to its inhabitants. In his song Dermot and the Earl, Maurice Regan who was Dermot McMurrogh’s interpreter we are told that, “to Robert De Bermingham (Strongbow gave) Offaly to the west of Offelon”. The ancient territory of Ui Failghe (of which Edenderry belonged) was ruled by the O’ Connor’s at the time of the arrival of the Norman De Bermingham’s. The Anglo- Norman process of colonising Leinster was checked by the natives, and this in turn made it necessary for Anglo-Norman lords to erect castles in the areas they had been granted land. The castle of Edenderry (later known as Blundell) was one such castle. There is no evidence today at the site of the castle to suggest that there was a previous earthen structure, however as O’ Brien points out, the De Bermingham’s did use two other sites, Drumcooley and Monasteroris where they built motte and bailey structures. The castles at Blundell and Carrick were probably later additions to the De Bermingham stronghold, being built towards the end of the thirteenth century. The De Bermingham’s main residence was at the well-fortified castle on Carbury Hill, from where their outlier castles of Blundell and Carrick could be clearly seen. The earliest recorded date for Carrick Feoris (Feoris meaning of the Bermingham’s) is 1305, when on Trinity Sunday, Piers De Bermingham, “the treacherous baron” murdered twenty- eight of the O’ Connor clan. They had been invited to celebrate the confirmation of the youngest of the O’Connor’s, Maiser who was thrown over the battlements of the castle. This event was later cited in the ‘Remonstrance’ of the Irish princes sent to the Pope in 1317. The castles of Blundell and Carrick were both built for one of the lesser Bermingham’s lords, but it is unlikely that they were built at the same time; perhaps the castle of Blundell was not a tower house when first built. Most tower houses are said to have been built in the fifteenth century, and it is about this time we have the earliest record for the castle of Edenderry. The annals record that John De Gray, Lord Lieutenant of Ireland, attacked the castle of Edenderry in 1427, as a result of an alliance between the De Bermingham's and the O’Connor’s. The castle it is said was devastated on this occasion, and perhaps it is more likely to assume that the tower house, the ruins of which remain, was added at this time. Little has ever been documented in secondary sources of Blundell castle, but a picture of instability can be traced around the castle when other documents and sources are examined. The fifteenth century was dominated by the O’Connor Faly clan who had through alliances and inter-marriage effectively ended the power of the De Bermingham’s. The O’Connor Faly stronghold was around their castle on Croghan Hill, from where Blundell Castle can be seen. Through the fifteenth and early sixteenth century, Blundell Castle was used by the O’Connor’s, who gave several defeats to the English, including at Geashill in 1406 and at Lucan in 1414. The O’Connor Faly also excelled themselves in kidnapping and held at their castle in Carbury, Thomas, Earl of Desmond having defeated him in battle in 1466. The demise of the O’Connor’s was brought about mainly by the feuding within the clan itself, which involved kinsmen who lived at Blundell Castle, Monasteroris and Carbury, all desperate to attain overall power on Croghan Hill. In 1511, Cahir O’Connor Faly was slain by his own people, the sons of Teige and John Ballagh O’Connor at Monasteroris. The attack on Monasteroris in 1521, in which the Earl of Sussex described Tethmoy (another name for the area of Ui Failghe) “as the strongest hold within the Irishry”, paved the way for the eventual control of the area by the English, and in particular the Colleys. The 1550 survey of the land surrounding Edenderry carried out by Walter Colley, surveyor general, mentions the castle of ‘Eadandyree’. In their article in Offaly History and Society, Andrews and Loeber make reference to the 1550 survey and the maps drawn by Cotton and Carew (both of which were probably made in the 1560’s). The Cotton map describes the castle of Edenderry as a tower house, the first record we find of this, and obviously the castle had been modified by Henry Colley, who had been granted the lands of Edenderry by Queen Elizabeth I in 1562. They make no mention of the castle of Edenderry in their list of newly built castles after 1550, another indication that the castle already existed and was modified by the Colleys in the 1560’s. The Colleys took control after the Plantation of 1556, however the castle was in the hands of Nicholas Herbert acting on behalf of the government from 1556-58, for which he was paid as warden. The Colleys and most of their English counterparts continued to go from strength to strength from the 1560’s onwards, and Henry Colley was appointed Deputy Lieutenant of King’s County in 1574, which was soon followed by Knighthood and Privy Council membership in 1576. The threat of the native Irish was never far away and the castle endured several attacks in the years that followed, which is a testament to the building of the tower house, that any part of it remains today. The castle was inherited by George Colley in 1581, who was active in establishing English control and stamping out the Gaelic ways. In 1597 we are told that Colley had cattle driven off his lands at Edenderry and that his country had been harried to the very doors of his castle by the native Irish engaged in the Nine Years War. Indeed the castle sustained a heavy bombardment when it was attacked in 1599 by the Earl of Tyrone’s forces. On this occasion the Earl’s forces were repelled and the castle, having suffered damage was saved. The castle remained in Colley hands until the 1650’s when it passed into the possession of George Blundell who had married Sarah Colley. There is no record of the castle having been attacked during the 1641 Rebellion or the Confederate wars, but it is likely as other castles in the area suffered damage during this turbulent decade. The Blundells came to national attention in 1674 when the three sons of Sarah and George, namely Francis, William and Winword were accused of murdering Thomas Preston the son of the Catholic peer Lord Tara. They were subsequently acquitted by Charles II. The war of the ‘Two Kings’ in 1690-91 brought about the eventual downfall of Blundell Castle. The Blundells had sided with the Williamite cause and having destroyed nearby Ballybrittan Castle, the Jacobite forces under the command of Lt. Col. O’Connor destroyed the castle and the town of Edenderry on 13 February 1691. The castle was deemed inhabitable and was never again occupied. The last recorded Blundell burials in Edenderry were those of Sarah in 1701 and Francis in 1707. In local myth passed on through generations, the castle is said to be haunted with the ghost of Sarah, Lady Blundell. The roof of the castle was probably made of slate, and there is evidence of slates from the roof of the tower house being used in the building of the Church of Ireland church in 1778, which is located about two hundred yards away. There is no evidence of any defensive measures outside the castle walls for example a bawn wall. That is to say there was not one at the time the Colley’s owned the castle, as the grounds saw major disturbance in the late seventeenth and early eighteenth century when Welsh miners were digging for iron ore in the hill, and could have possibly removed this defence. At the castle one can make out three windows on the ground floor of the building, which is possible to suggest that cooking of some sort was done at this level. It is interesting to note that the stonework over the window frame has not been stolen or taken elsewhere, as is the case with other windows in the tower and at Carrick Castle. Mairead Evans and Noel Whelan (eds. ), Edenderry through the ages, (Edenderry, 2000), p. 2. Caimin O’ Brien, ‘The Earthwork Castles of Anglo-Norman Offaly’, in William Nolan and Timothy P O’ Neill (eds. ), Offaly History and Society: interdisciplinary essays on the history of an Irish county, (Dublin, 1998) p. 132. Annals of Innisfallen, p. 52. JH Andrews and Rolf Loeber (eds. ), ‘An Elizabethan Map of Leix and Offaly: Cartography, Topography and Architecture’, in William Nolan and Timothy P O’Neill (eds. ), Offaly History and Society, (Dublin, 1998), p. 273. Caimin O’ Brien, ‘The Earthwork Castles of Anglo-Norman Offaly’, in Nolan and O’Neill (eds), Offaly history and Society, (Dublin 1998), p. 273. Charles Mosley (ed. ), Burke’s Peerage and Baronetage, 106 edition, 2 vols, (Switzerland 1999) p. 2971. R Dunlop, ‘Plantation of Leix and Offaly 1556-1622’, in English Historical Review, (January, 1891), p. 88. Harman Murtagh, ‘Jacobite Offaly 1689-91’, in Nolan and O’Neill (eds. ), Offaly History and Society, (Dublin , 1998), p. 329.